One of the more fun parts of my job is getting to travel to different cities for meetings and conferences. 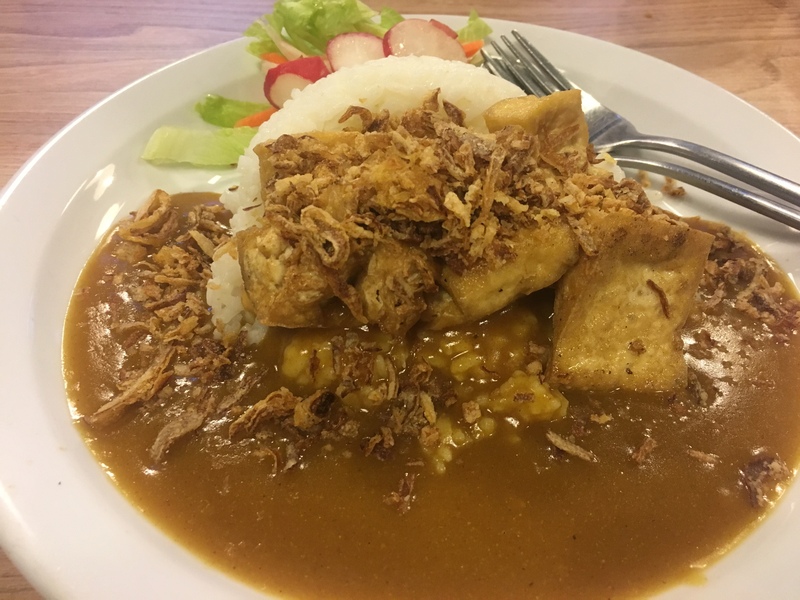 Even visiting different places in the UK which probably don’t seem that glamorous, I make sure to take the opportunity to try some of the best of the city’s vegan food offering. On our first night, we decided to visit TukTuck. It had come up multiple times in recommendations to me and the menu looked perfect for a party of two vegetarians and myself. In the end however we ended up with a full table of vegan dishes. I am a sucker for a katsu so I went for the tofu, with a mango and edamame salad. It’s a relaxed vibe where you order and pay upfront at the counter and the food comes out pretty quickly, fast food style. The prices were very low so I was surprised at the relatively generous portion sizes. My tofu was the perfect texture for me, and had absorbed plenty of that katsu flavour from the sauce. The rice was nicely cooked and it came with a little token salad on the side which was fine. 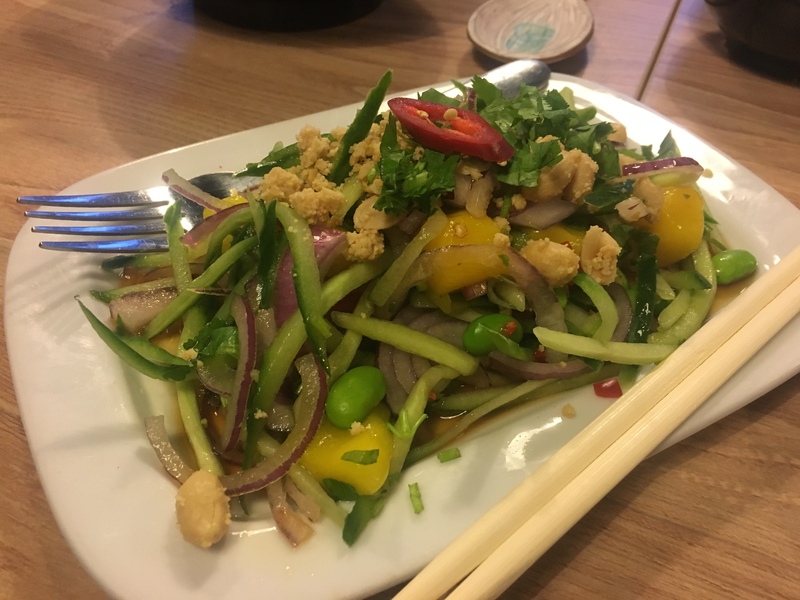 The mango and edamame salad was fresh and zingy, with some chilli heat from the dressing. There was plenty of sweet fresh mango tossed in there with crisp sliced veggies. At only a fiver it was more than worth it, especially as I felt less guilty about the meal having had one of my five a day. 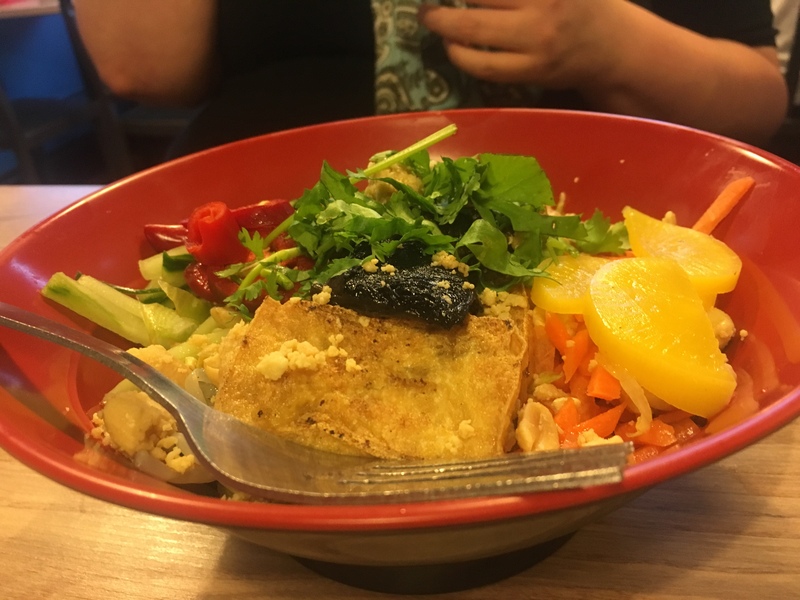 My colleague tried the other vegan Asian salad on the menu, which came layered with tofu and mushroom. She ate about half and I had no shame in asking her if I could finish off the rest. The mushrooms and tofu were both really flavourful. Again, crunchy beansprouts, black sesame seeds, and lots of chilli, made this a welcome tasty addition to the meal. Our other colleague ordered the vegan kimchi fries and a side of edamame beans. 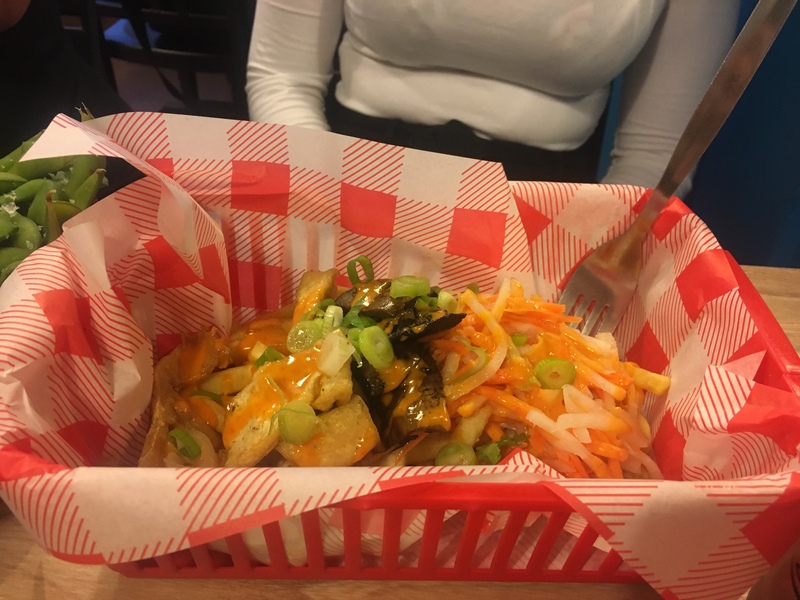 The fries looked so good, and we were told kimchi usually has fish sauce in so it’s great to find a vegan-friendly option. I didn’t try any of her meal but she recommended it too! The next morning for a quick breakfast, we stopped at Exchange Coffee Shop and Kitchen. It’s a little independent record store with an almost fully vegan menu, right by my hotel in the city centre, which I wasn’t expecting at all. 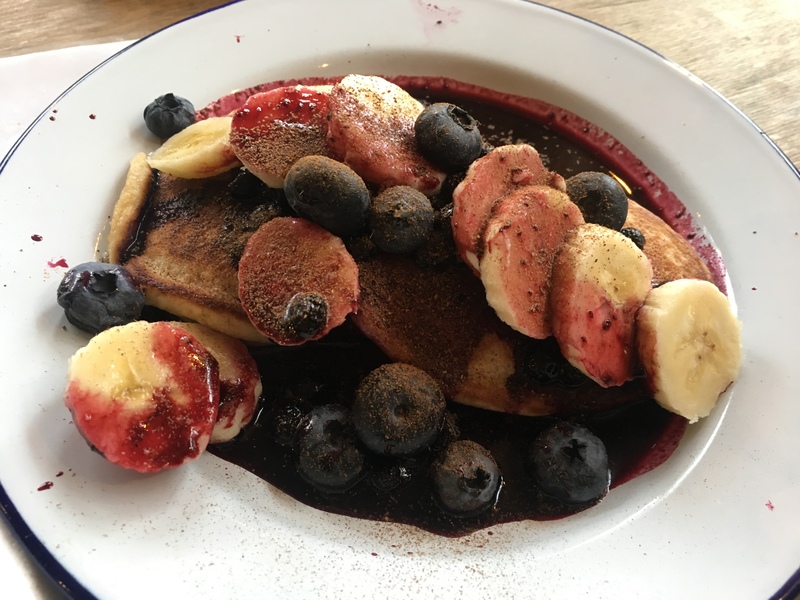 I ordered the vegan pancakes, which were light and fluffy, and smothered in a delicious blueberry compote with ample fresh blueberries and banana slices on top. There were just two pancakes, but they were pretty filling, and at £3 a stack it was possibly the cheapest I’ve ever seen pancakes served at. Alongside it I ordered a breakfast smoothie (yes, I am aware I effectively had two breakfasts). It was a blend of berries, oats, chia seeds, and almond milk, and was deliciously creamy and filling. 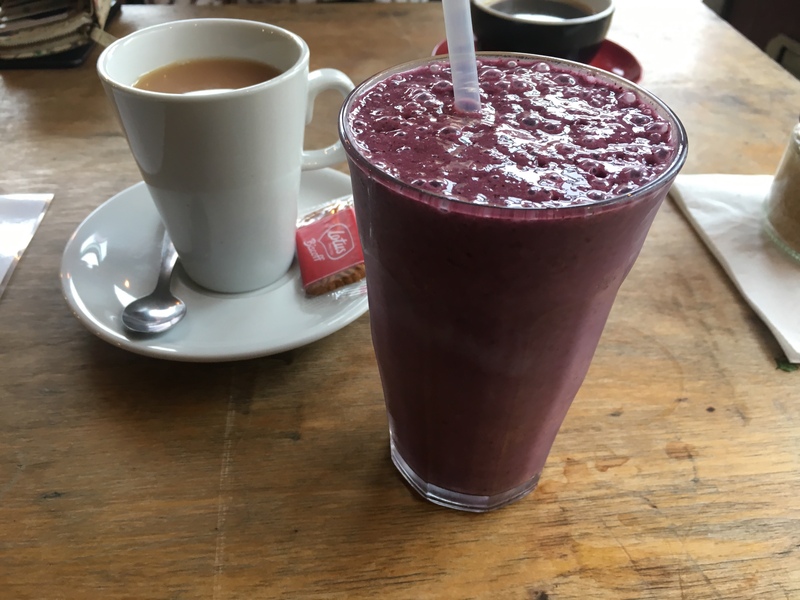 I was sceptical that a smoothie alone could be filling enough for breakfast but this one definitely was! That evening, we visited Café Kino, again recommended to me by multiple people on Instagram. We arrived in our work clothes straight from the conference, and felt ashamed at our corporate appearance, making us by far the least cool people in the building. It was another casual affair, have a look at the menu and order and pay at the counter when you’re ready. 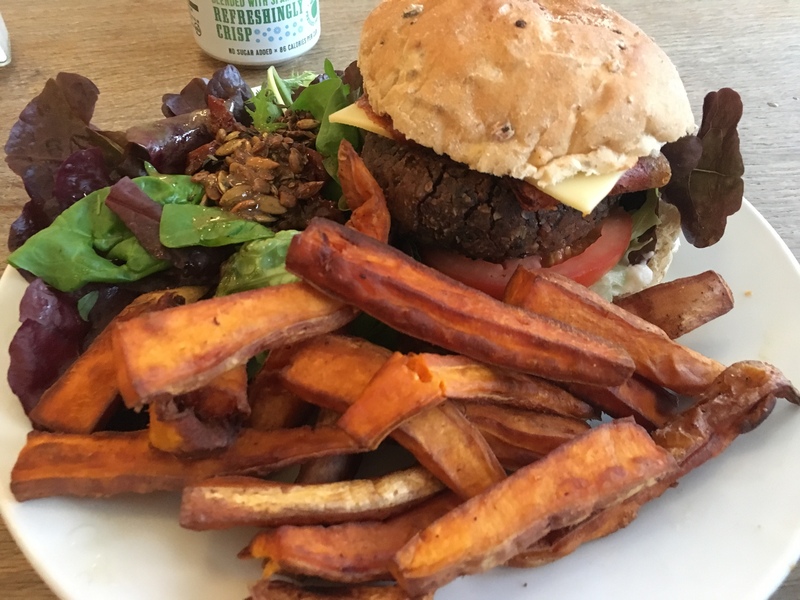 I was always going to choose a burger, and deliberated a little while before settling on the BBQ burger with added cheese and facon, with a side of sweet potato fries and a Kino salad. Apart from a little mix up with our orders which was easily solved by swapping my fries with a colleague (there seemed to be only three members of staff looking after the whole place, and although its small enough, it was super busy). The burger itself was huge, and although it was quite crumbly, the cheese and bacon held it together well enough. I did miss the coleslaw which was advertised on the menu but I think they forgot to put in the burger – although, it definitely wasn’t dry, that’s just me being greedy! The salad was really tasty and felt like a welcome addition to the plate rather than just an afterthought. 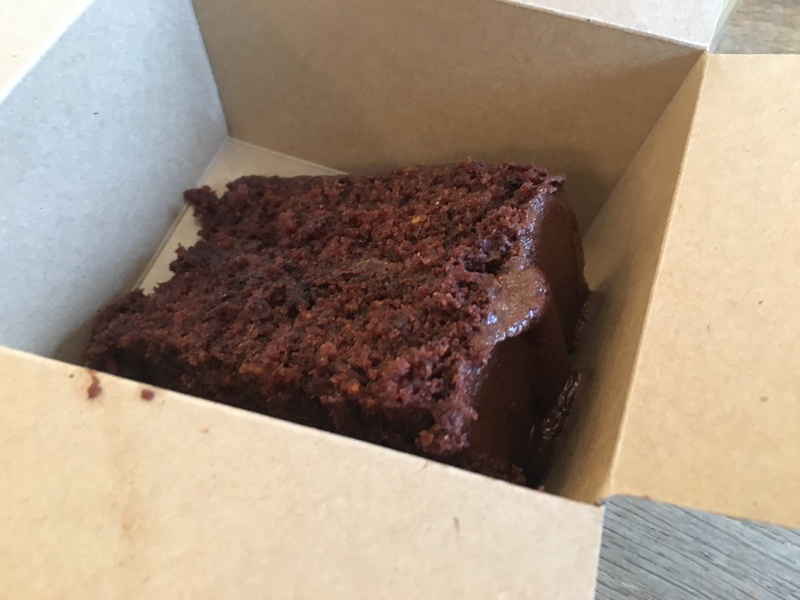 The meal was so filling that I picked up a slice of chocolate cake to go, which I ended up eating the next day. It was again a generous sized slice, decadent and delicious. For a little twist, it was filled with chai spice and absolutely delicious. 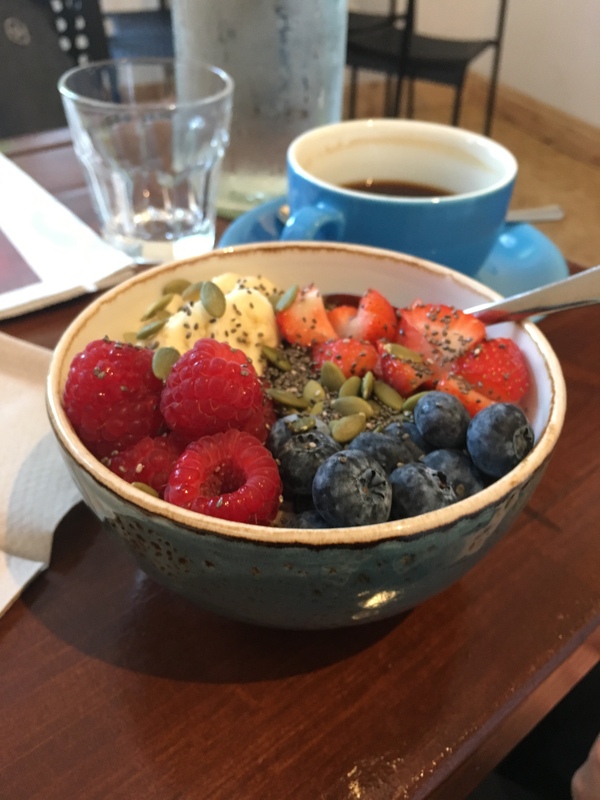 The next morning, we visited the Bristol Porridge Project for breakfast. For those who know me, I wouldn’t need to say that this is my idea of heaven. I definitely eat some form of oats every day. For breakfast in winter I have a warming porridge, and in summer I go for overnight oats. Upon entering the café you are presented with an array of porridge topping combinations on black board (I took a sneaky photo so I could recreate some of them at home). There were only one or two which weren’t vegan. 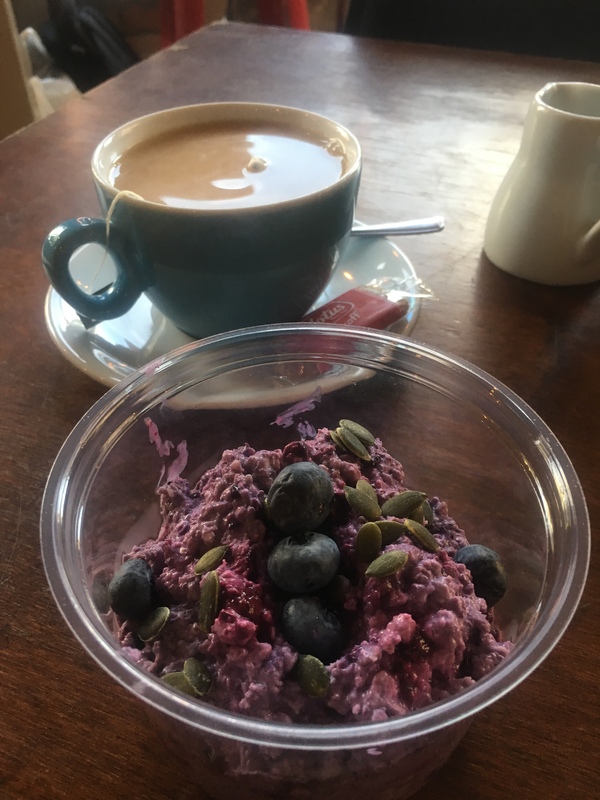 With the majority at £3 a bowl, it’s really not an excessive amount to pay for breakfast out, and certainly much better than the obscene £16 my hotel were asking for. There were a handful of ‘limited edition’ style bowls available at £4, one of which I ended up going for because it featured all my favourite things. 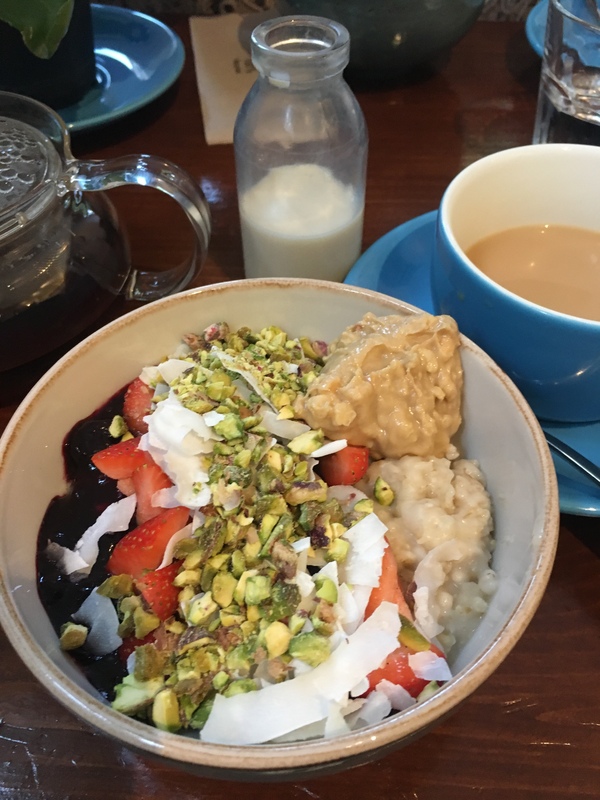 The porridge was cooked to just the thickness I like, and the bowl was absolutely loaded with toppings: in my case, peanut butter, pistachios, strawberries, coconut shavings, and a berry compote. It looked like a fairly small bowl but it was full to the brim and I struggled to get to the end of it. Despite being very full though, I managed it, because it was too delicious to leave any. One of my colleagues ordered a mixed berry bowl, and the other ordered an apple crumble. They both looked heavenly and if I lived in Bristol I could guarantee you I’d work my way through the list of porridge on offer quite quickly! We ended up ordering a fairly boring takeaway for dinner as we were tired from the conference, but during the day I did manage to take a trip to Mrs Potts Chocolate House and pick up a few goodies to take home. I am a sucker for vegan baked goods. 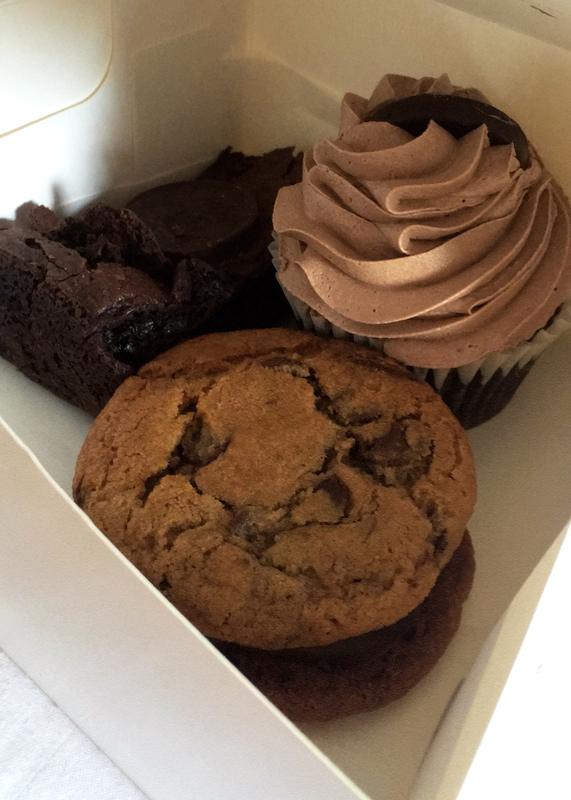 I got a rich & fudgy chocolate brownie, a chocolate chip cookie sandwich, and a chocolate cupcake. I wasn’t sure what the cupcake frosting was made from but it was light and almost marshmallowy. It had a bit of a different flavour to any buttercream or frosting I’ve tasted before, which I wasn’t sure I liked, but Jamie enjoyed it. 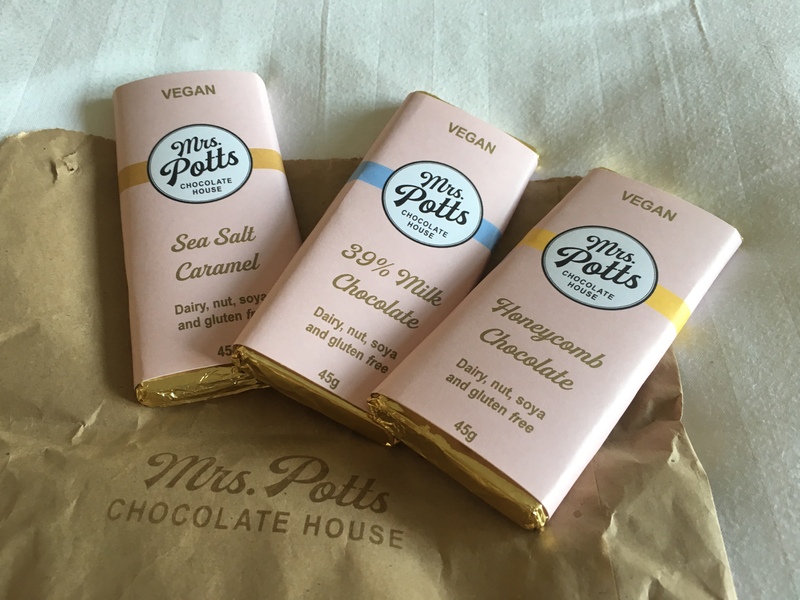 Mrs Potts’ also sell their own homemade vegan chocolate bars which I think were my favourite out of everything I bought there. They were deliciously creamy, and came in the cutest packaging. The next morning brought my last day in Bristol, and I felt sad that I couldn’t have stayed a bit longer, there was so much to explore that I didn’t get a chance to because I was working! Still, I think I made the most of the food. 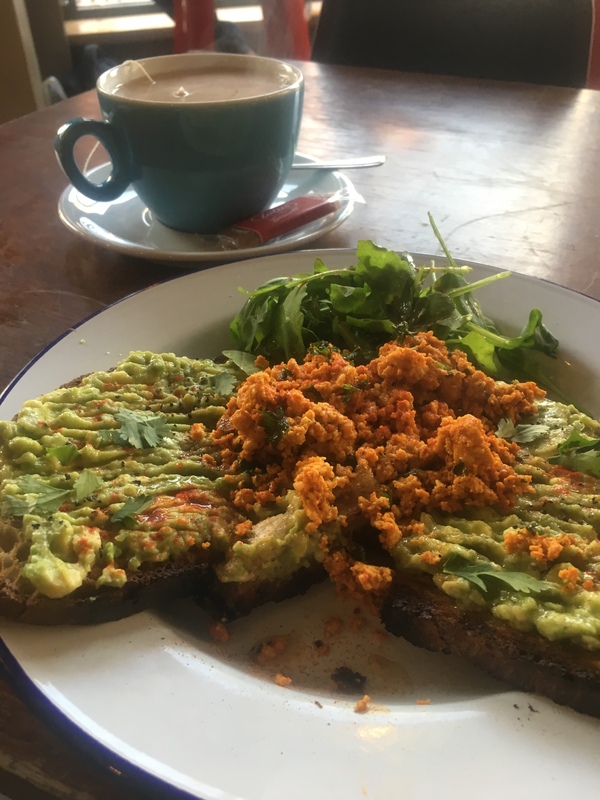 I went back to Exchanges for breakfast, and got avocado on toast with scrambled tofu, served with a rocket side salad. With a squeeze of lime, it was zingy and fresh, and the tofu scramble was very flavourful. I also picked up a pot of overnight oats to take to the conference for lunch, because the catering at the conference had been pretty questionable. It was only about £2.50 and a huge portion, filling me up for lunch without the need for anything else. It tasted great and some fresh blueberries and seeds on top gave it a bit of added texture. I know if this was on my way to work every day I’d be a regular.